Commentary: Freeing up money for transit system will help put people back to work: "Surveys and passenger counts indicate that work-related travel represents close to 50 percent of all transit trips. Access to educational opportunities, like job training, is another significant way that people use the bus. The high percentage of work-related travel might make more sense to you if you keep in mind that the latest census figures on auto ownership indicate that 16 percent of Racine households don’t own a car." Alliance pushes for mass transit funding: "There is a need for additional funding in communities statewide for workers and others who depend on mass transit, the Urban Alliance of the League of Wisconsin Municipalities told state legislators in a letter on Friday supporting the bill. “You can’t build businesses and job growth if you don’t have transportation to get people to jobs,” said Mayor John Dickert, also president of the alliance, adding one of the biggest complaints he’s heard about the bus cuts was from the business community." Milwaukee Transit Riders Union: "The fight for good public transportation is a fight for social and economic justice, for equality in mobility, and for the dignity for all Milwaukeeans. We believe that all Milwaukeeans deserve the dignity of having easy access to jobs and social opportunities throughout our area." State bill revives idea of busing sales tax in Milwaukee County - Milwaukee - The Business Journal: "Milwaukee County could create a regional transit authority with voter approval to levy a 0.5 percent sales tax to pay for busing under a bill introduced this week by state Democratic legislators." 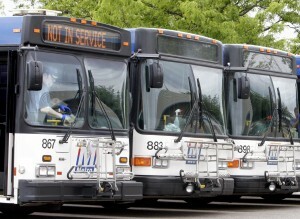 A record number of riders boarded Metro Transit buses in Madison in 2011. Record number rode Madison Metro buses in 2011: "The buses in Madison were filled with more people than ever in 2011, as riders on fixed routes for Metro Transit totaled nearly 15 million, up more than 10 percent over 2010. "